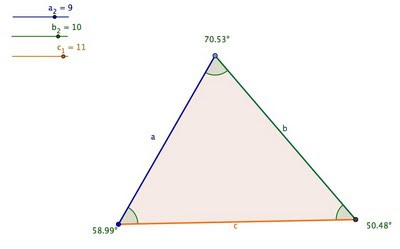 What can we deduce from the side lengths of a triangle? This is a preservice teacher activity, easily adaptable to middle or high school use. GeoGebra is a free dynamic geometry program available as an online applet or downloadable program, from geogebra.org. Objective: TLW explore triangle properties relating type and side length. Schema Activation: What are the 7 triangle types? Fill them in in the ‘Type’ column below. You'll fill in the other columns as you go through the activity. .....Type ....................... Examples [Like (3,5,5) ] .......................What do you notice? Focus: One of the reasons dynamic geometry is so powerful is the support it allows the teacher (or curriculum designer) to give students for finding examples. Lots of examples. As we’ve discussed in class, the natural way we reason is to go from lots of specific examples to the general. a. Collect at least 2 examples of each type of triangle. Where possible, try not to have the triangles be similar, where all the sides are multiples of another triangle. b. Which were hardest to find? Was it something to do with the type or how you were looking? b. Check your other examples on this sketch. 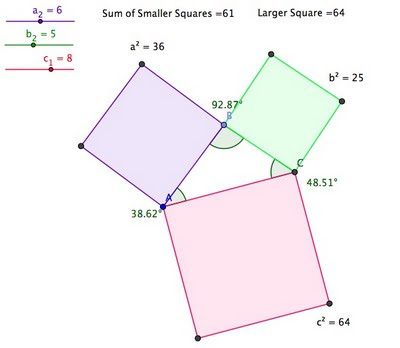 For each, record whether the sum of the areas of the smaller squares is <, =, or > the area of the large square. c. What pattern(s) do you notice? d. Why do you think your pattern(s) might be true? 3) Go to http://teachers.henrico.k12.va.us/math/GeoGebra_Site/pythagoras/pythaPrblm1.html (link on Blackboard) for the Ladder sketch. Answer the questions there. a. How high will he get if he places the ladder 3 m off the wall? Drag the ladder point and find a solution. Sketch the solution with all its lengths (s, r, h) on paper. b. Now, calculate the solution of task (a) on paper. Which lengths are given, which are sought? Do you get the same solution? 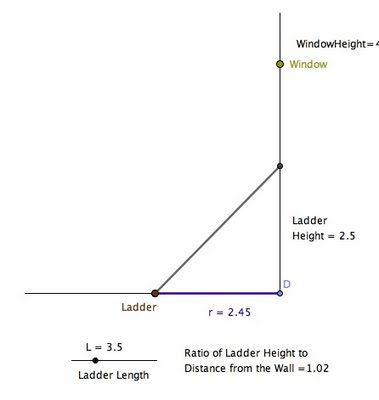 c. At what distance of the wall should Pythagoras place his ladder in order to reach the window 4.50 m above the ground? Sketch the solution with all its lengths (s, r, h) on paper. d. Now, calculate the solution of task (c) on paper. Compare your solution to your sketch? e. As a teacher, what do you notice about the difference between doing the tasks in sketch and on the paper? a. What young Pythagoras might not have known is that a safe ladder ratio is 4:1 for the height to distance from the wall. What length ladder does he need to reach the window safely? Is there one solution or more? b. How would you solve this problem on paper? a. What confirmed, new or deepened understanding did you develop regarding triangles through these activities? b. How did the dynamic environment affect your understanding? Be sure to look at the comments. Scott Farrar has some notes on using this with 9th grade geometry, and has added a complimentary activity. I just used your Triangles By Side in a lesson for 9th grade geometry. It worked very well. I added a second mathlet to go along with yours: one that hints at the triangle inequality. 1. Students were a little confused about starting with the scalene. There's not much to "observe" there. I think the best one to start with is the isosceles. 2. Its kind of a shame that the 3,4,5 and 6,8,10 are the only right triangles possible. Next time I would bump the sliders up to 13 so that students could make a 5,12,13. 3. I used your mathlet for "Triangle Side Limits" first. Pros: integer lengths for c are easy to list. Cons: students don't automatically consider fractional side lengths for side c. This can be a pro, however: A kid says if a=4 and b=6, c can be 3, 4, 5, 6, 7, 8, 9. Then they are ripe for me to ask "can c be 2 and a half?" They can flip back and forth from c=2 and c=3 to guess at what c=2.5 looks like. In contrast, I just made a new mathlet to go along with the Triangle Inequality portion of the activity. I think it might be "too helpful" for day 2 of triangles. This is probably better as a review or lecture demonstration.